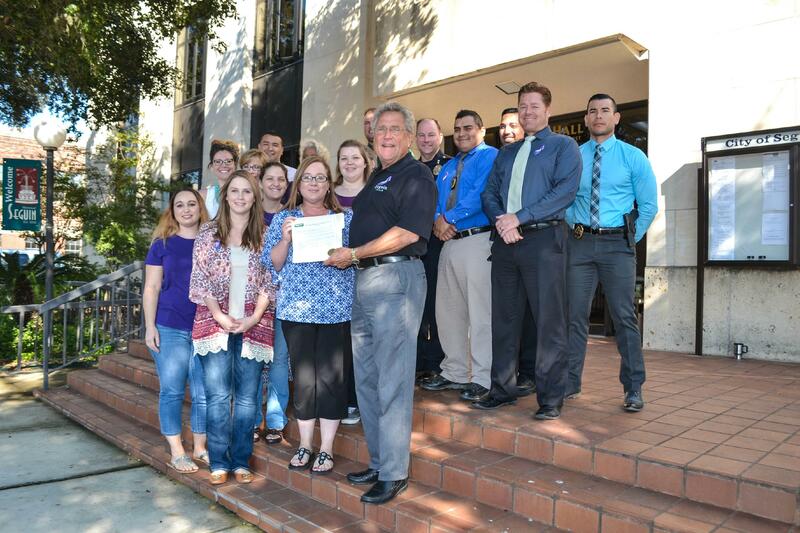 SEGUIN, Texas - Mayor Don Keil has proclaimed the month of October as Domestic Violence Awareness Month in the City of Seguin. Representatives of the Guadalupe Valley Family Violence Shelter, the Guadalupe County Children’s Advocacy Center and Seguin Police Department officer met with the mayor as he read and signed the proclamation. “We want to show a united front as a community that we take a stand against domestic violence,” said Jennifer Fernandez, GVFVS Executive Director. According to GVFVS’ website, the shelter serves Gonzalex, Guadalupe, Karnes and Wilson Counties and about 500 women and children each year.Their goal is to help victims of violence recover emotionally and physically, and “build a life free from violence”. The National Coalition Against Domestic Violence (NCADV) reports that 75% of 16 to 24 year olds in Texas have experienced dating violence or know someone who has. The LED lighted water tower on 123 bypass will alternate pink for Breast Cancer Awareness Month and purple for Domestic Violence Awareness Month in October. “We’ll be handing out purple ribbons throughout the month and October 20th is Wear Purple Day so we’re asking folks to wear purple and show their support,” said Fernandez. Click here to view proclamation. Pictured: Mayor Don Keil and representatives of the Guadalupe Valley Family Violence Shelter, Guadalupe Co. Children’s Advocacy Center and Seguin PD.